A fee being levied from the people by the relevant local government (LG) bodies for the collection of their garbage might bring about a positive change in attitude among the population, Chairman of the Urban Development Authority (UDA) Dr. Jagath Munasinghe said today. 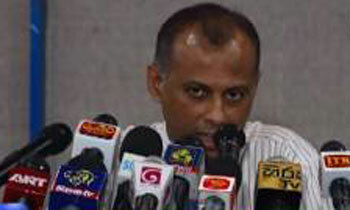 When asked by Daily Mirror, whether the UDA was planning to make a proposal to impose a fee for collecting garbage from each household, Dr. Munasinghe said it was up to the LG bodies to make a decision in this regard. “It’s the Urban Councils and Pradeshiya Sabhas which possess the legal authority to collect taxes. If households are to be charged for collecting garbage, these bodies should make a decision. However, we can and will help them if they decide to implement such a move,” he said. LG bodies which are struggling in terms of revenue could make use of the funds collected by imposing such a charge, Dr. Munasinghe said. To whom the hell have I been paying all this time? The garbage collector won't even take the garbage if I don't pay him a monthly fee. It is not a new or additional responsibility for local bodies. The issue is local bodies failed to plan out their activitities as a result publics who pays the tex are suffering.Offiers who has been paid from the collected tex failed in their duties to be punished. In Colombo people pay collectors to take out construction debris etc. And they think they pay for garbage collection. Even leaves they expect them to take. Garbage is generally kitchen waste. For our people if a toilet is re done, all the remnats are referred as garbage. Even mattresses are garbage. LG bodies are already collecting annual taxes from residents for providing this service among others. Is the Chairman not aware of this. Garbage collection is going on satisfactorily and their problem is finding dumping grounds and UDA must help them on this issue. He does not know people always pay their annual taxes to local authorities. What more does he want? The problem is in dumping and not in collecting. The fee is not a good idea. then what are we already paying a municipal tax for? Yes, a good idea. The rates need to be increased to handle garbage. Nothing should be free. We are already paying annual rates to the Municipal Council. That is for services including garbage collection. We as citizens pay the local council tax. Isn't it part of the service such as garbage collection? Correct me if I'm wrong. Governments become unpopular because of this type of people. An unqualified clerk may suggest such a silly and burdensome proposal. Does not this man know that already house holds pay a tax called "Assesment Tax". This is for such services fyI. What nonsense is he speaking? At present almost all households within the Colombo district pay the garbage collectors a monthly fee (baksheesh) or else one's garbage will not be taken away.